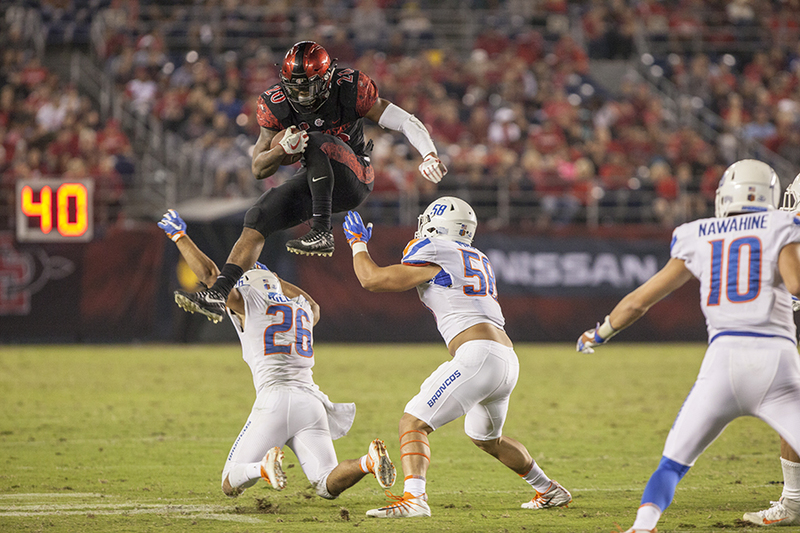 Senior running back Rashaad Penny hurdles two Boise State defenders during SDSU's 31-14 loss to the Broncos on Oct. 14. Follow senior running back Rashaad Penny as he travels through college football award limbo, and go inside the minds of the voters who put him there. Rashaad Penny had just completed the game of his life. 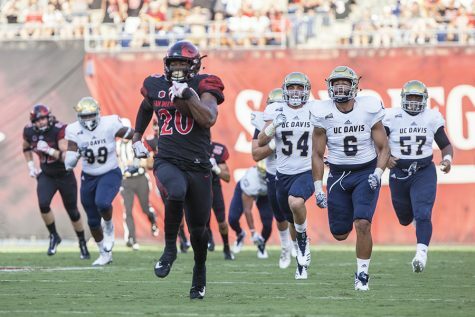 San Diego State’s All-American senior running back ran for 222 yards with three total touchdowns and eclipsed a school record with 429 all-purpose yards during the Aztecs’ 42-23 victory over the University of Nevada on Nov. 18. Penny returned both a kickoff and punt for a touchdown in the game and as he walked into the postgame press conference — alongside his redshirt junior quarterback Christian Chapman and junior linebacker Ronley Lakalaka — members of the media were instructed to ask him questions first because he was needed elsewhere. Once Penny was ushered out of the room, followed shortly thereafter by his teammates, SDSU football head coach Rocky Long came to the podium. He did not mince words. The performance was not an anomaly for Penny, who had spent the year carving up defenses while racking up an FBS-best 1,824 rushing yards as of the Nevada game. Penny was on the list for multiple different awards, including the Doak Walker Award, given annually by sports writers to the nation’s best running back, and the Heisman Trophy, which is awarded to the best player in college football. Long, SDSU’s grizzled veteran coach who got his coaching start as a graduate assistant at the University of New Mexico in 1972, bristled at the idea that Penny would ultimately get the recognition and respect he’d earned. After what Penny had achieved that night, Long was asked if voters would have no choice but to recognize him. Only two days later, on Nov. 20, the three Doak Walker Award finalists were named. Penny, the nation’s leading rusher, was not one of them. Long’s premonition had come true. How could the nation’s leading rusher and all-purpose yards leader be left out as a finalist for an award given to the best running back? 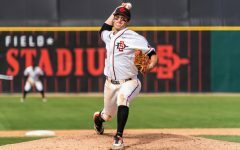 Was it simply that people on the east coast weren’t able to watch the Aztecs late evening games? Or, as Long would suggest, could there be a more sinister reason? 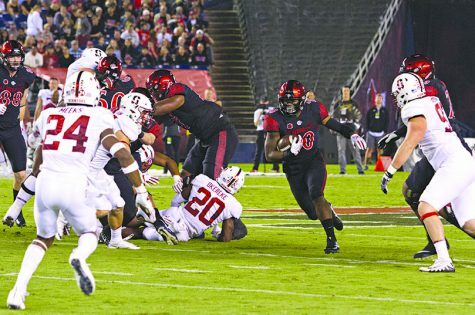 Senior running back Rashaad Penny outruns the entire UC Davis defense on his way to a touchdown. Photo by Kelly Smiley. It is true that there is a financial gap between Group of Five conference schools and schools in the Power Five – which includes the Pacific-12 Conference, Atlantic Coast Conference, Southeastern Conference, Big Ten Conference, and Big 12 Conference – the reason for the disparity is largely due to annual television contracts. The Pac-12, for instance, has a contract with television networks Fox and ESPN worth a total of $250 million annually, a hefty amount which is in addition to other sources of television revenue, such as the Pac-12 Network. All told, each school in the Pac-12 earned $29 million in the last fiscal year, according to the Los Angeles Times. Big Ten schools made roughly $35 million each, while SEC schools earned $40 million apiece, according to the same report. In contrast, the majority of schools in the Mountain West Conference, which SDSU has called home since the conference’s birth in 1999, earn roughly $1 million per year from its partnership with ESPN, CBS, and AT&T Sports Net, according to a report from USA Today. Penny hits the hole against Stanford. Photo by Andrew Dyer. The accusations from Long are damning, but some voters said he’s not completely off base. Mark Anderson, the 2016 President of the Football Writers Association of America and a University of Nevada, Las Vegas, football and basketball beat reporter for the Las Vegas Review-Journal, is a voter who agreed with Long’s initial statement but dismissed his overall claims. Bob Asmussen, a college football columnist at the Illinois-based Champaign News-Gazette, is another voter who dismissed Long’s claims. Asmussen said that he voted for Penny to be a finalist. Shawn Harrison, the Sports Editor at the Herald Journal in Logan, Utah, also had Penny as a finalist and did not discredit Long’s assertion. 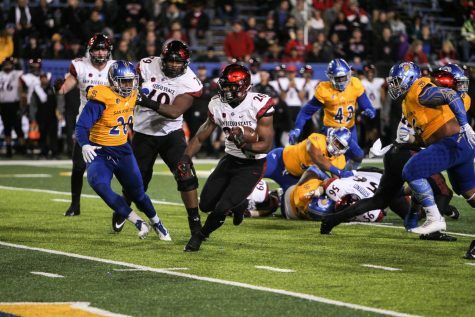 Senior running back Rashaad Penny makes a cut on his way to a touchdown in the third quarter of SDSU’s 52-7 win over San Jose State. Photo courtesy of Kavin Mistry, The Spear. Since its inception in 1990, there has been only one Doak Walker Award winner from a school that is currently outside of the Power Five conference – Trevor Cobb, who won the award in 1991 after rushing for 1,692 yards at Rice University. Rice now plays in Conference USA, but at the time was part of the now-defunct Southwest Conference. This also isn’t the first time that the Doak Walker Award has been in shrouded in controversy. Back in 1995-96, Iowa State’s Troy Davis ran for two consecutive 2,000-yard seasons, the only running back in college football to ever accomplish the feat. Davis never won the Doak Walker Award, and that was the last time Randy Peterson, a senior sports reporter at Iowa’s Des Moines Register, would cast his vote. “I haven’t voted since that snub,” Peterson wrote in an email. The three finalists for the Doak Walker Award this season were all from Power Five schools and included Saquon Barkley from Penn State University, Jonathan Taylor from the University of Wisconsin and eventual-winner Bryce Love from Stanford University. Teddy Greenstein, a sports columnist at the Chicago Tribune, said that he did not vote for Penny to be a Doak Walker finalist, instead choosing the eventual finalists, all of whom he had seen play. Greenstein also dismissed the notion that there was a conspiracy against players from non-Power Five schools. “It’s not like I see any of that Power 5 money!” he wrote. 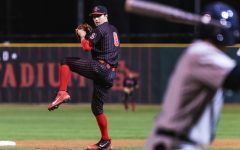 The Aztecs played only one afternoon game this season, which created a challenge for potential East Coast viewers. But is it the responsibility of the voter to ensure they are familiar with all the players in the country? According to Chris Korman, a reporter for USA Today who was a Doak Walker Award voter up until 2010 when he left his position at the Bloomington Herald-Times in Indiana, it isn’t that simple. Penny wrapped up his regular season with 203 yards rushing against New Mexico on Nov. 24, giving him a nation-leading total of 2,027 yards on the year and extending his school record to four straight games with 200-plus yards on the ground. Penny could only wait and see if he would be named a finalist for the Heisman Trophy, but the running back was not holding his breath after the game. On Dec. 4, the Heisman Trophy Trust released their final three candidates, each of whom would fly to New York to be part of the Heisman Memorial Trophy Gala on Dec. 10. Penny, once again, did not make the cut. SDSU offensive coordinator Jeff Horton, who had been vocal about his displeasure after the Doak Walker Award snub, once again questioned the system. Tom Murphy, a reporter for the Arkansas Democrat-Gazette, voted for Penny to be a finalist for the Doak Walker Award but said that the level of competition Penny faced was not enough to warrant a Heisman vote. The issue appeared to be that Penny, who ultimately finished fifth in the Heisman vote, did not – and, realistically, could not – prove that he would have produced the same statistics had he been competing against Power Five defenses all season. Penny did his part in the Aztecs’ two games against Power Five opponents – Arizona State University and Stanford University from the Pac-12 – rushing for 216 yards and 175 yards, respectively. Herbert Gould, a voter who describes himself as semi-retired from the Chicago Sun-Times, said the reality is that Penny was up against multiple obstacles. Whether it be voters who slept through Penny’s season, ones who doubted the merits of his accomplishments or those who simply didn’t care to know about them, above all else they were simply following the status quo. 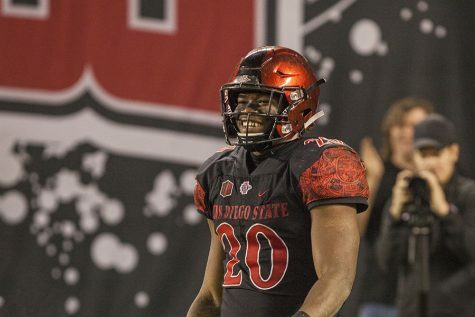 Rashaad Penny is all smiles during the Aztecs 42-23 victory over Nevada on Nov. 18 at SDCCU Stadium. Photo by Kelly Smiley. As it would turn out, however, all good things eventually come to those who wait. 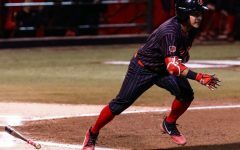 Penny was selected as a First-Team All-American by nine different media outlets, as reported by SDSU’s sports media relations department. Penny was also named an FBS Consensus All-American, and was a finalist for the Walter Camp Player-of-the-Year. Ralph Routon, a columnist for the Colorado Springs Independent, said that Penny ultimately getting recognition should somewhat make up for his earlier slights, and put to bed the idea they had been intentional. Only one game remains for Penny, with the team slated to face off against Army in the Armed Forces Bowl in Fort Worth on Dec. 23. Penny will need to rush for 107 yards in the game to break the single-season school rushing record of 2,133 yards, set just last year by Donnel Pumphrey. Whether that happens or not, Penny has left his mark on campus and in the school record book, and if you listen to his words after his final game at SDCCU stadium, he has already received all the recognition he would ever need.